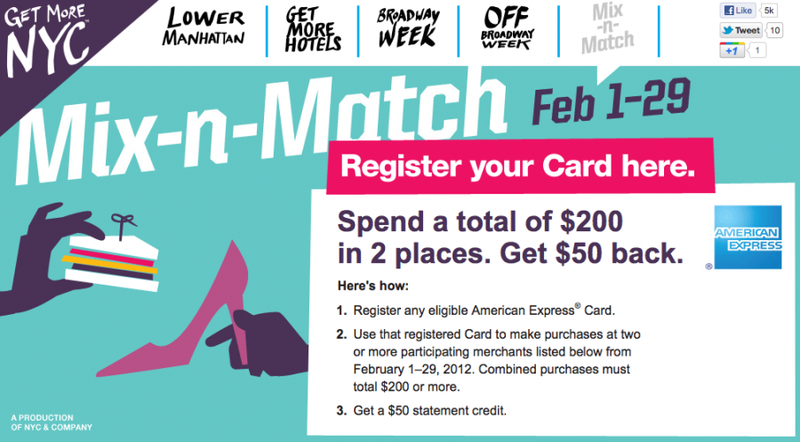 To get people visiting the Big Apple and spending money this winter, NYC & Co. (basically the city’s tourism board) has teamed up with American Express to give cardholders a $50 statement credit when they spend a total of $200 at two participating merchants in New York City between February 1-29, 2012. To qualify, you must register your card between now and February 29, 2012. However, enrollment for this promo is limited to the first 10,000 cardholders who register, so you’d better act fast if you want to take advantage of this offer. To qualify for the statement credit, cardholders must register their eligible American Express card. To be eligible for this offer, you must register any eligible American Express Card at amexnetwork.com/getmore between January 18, 2012 and February 29, 2012. Registration is limited to the first 10,000 enrollees. You may only register one Card for this offer. Using the same registered Card for each transaction, you must make purchase(s) in store at over 300 participating merchants between February 1, 2012 and February 29, 2012. Offer not valid on online purchases, except for purchases at ticketmaster.com or telecharge.com. Using the same registered Card for each transaction, you must transact at least two times and spend a combined $200 at participating merchants that accept American Express Cards. Prepaid and corporate cards, and ExpressPay transactions are not eligible. Statement credits are generally issued within five business days after your qualifying purchase(s), but may take up to two billing cycles to post to your account. Limit one statement credit per Cardmember. If your Card is replaced during the promotional period, please call the customer service number on the back of your Card for assistance. Additional terms apply. See registration site for details. ©2012 American Express Company. All rights reserved. You can find the entire list of participating merchants here. It includes restaurants like Gordon Ramsay and Serafina, shops including Lacoste and Scoop NYC (and even Costco), and tickets to Broadway shows like Jersey Boys and Priscilla, Queen of the Desert, among other categories. Just remember, you have to spend the money with at least two merchants to get the $50 statement credit. If you’re planning a trip to New York in February—maybe for a romantic Valentine’s getaway—this could be a good way to save some money while still having fun.